At the top of a pedestrian subway in Southampton (but not in the High Street). This little garden has a lawn and leaves and flowers. If I have a mission, it's to persuade people that every street is a garden. Not has a garden, note; but is one. My theory is that in every street there are flowers and lawns and trees and . 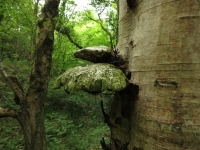 . . it's just a matter of adjusting your sense of scale and looking for them. 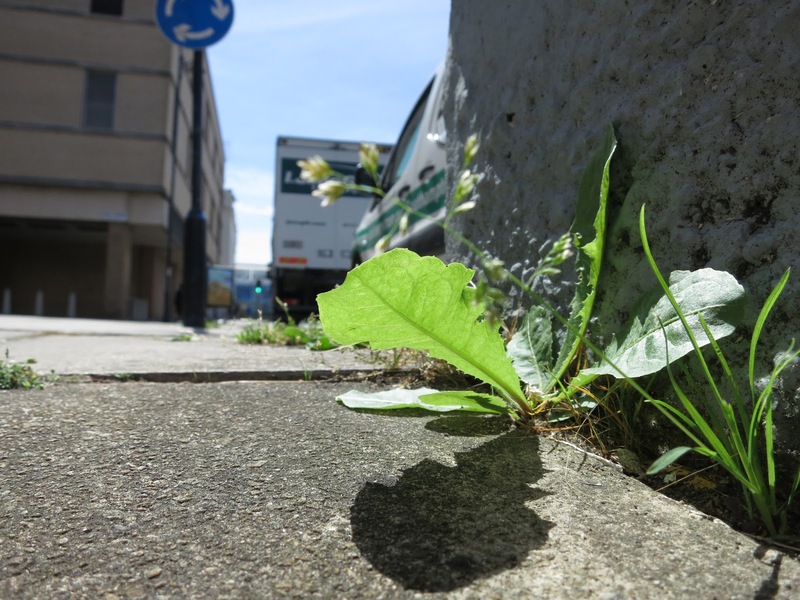 Those of you who have been reading Loose and Leafy over the years will be familiar with my posts about street plants. Until now I've gone to towns I already know so I've had good ideas about where to look. trees put there by the council don't count. On Wednesday I was in Southampton. I've been there in the past but not much. I once went to an art exhibition. I accompanied a friend to a shop where they sell exceptionally smelly soaps. I've visited a road which used to be a wharf but is now a long way from water. That's about it. 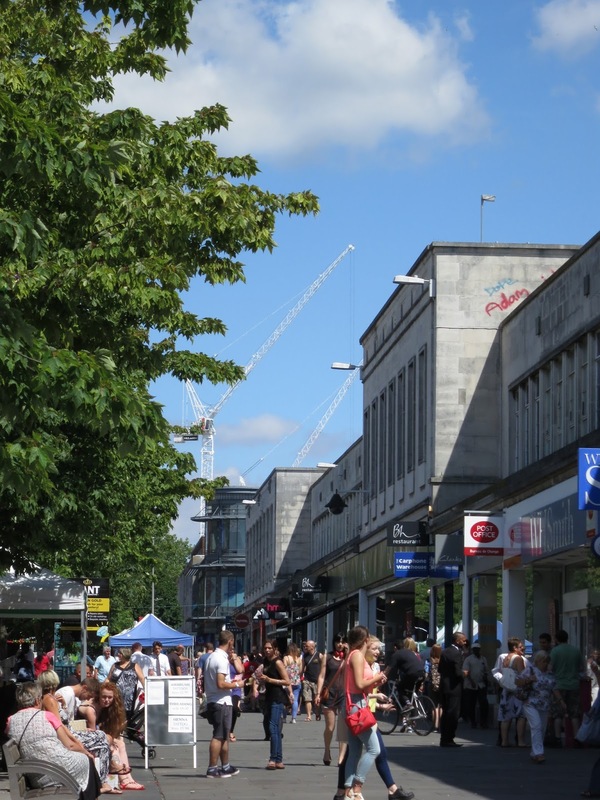 The main shopping street in Southampton is broad and for half its length traffic free. At one end there's a lumpy entrance you can walk through or round - The Bargate. (Built around 1180). At the other - where the traffic is - a park. In between are the usual City Centre shops, all built since the Second World War. (Southampton was bombed.) Some have doors opening directly onto the street. Others are in arcades. Some of the architecture is very grand and modern. Some is dated and beginning to decay. There were market stalls the day I was there. And a roundabout. but I would have felt awkward asking people to move their feet so I could take its picture. Time to put my theory to the test. This is a very busy street. Is it also a garden? It didn't look promising. But there's no point in having a theory unless you put it to the test. Shopping centres where rubbish is collected and pavements forever swept clean can be arid and dull. 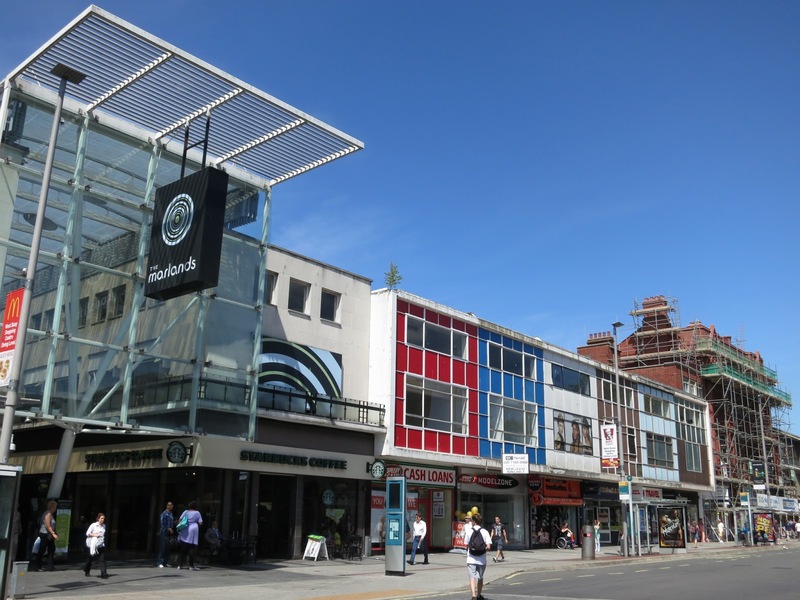 From that perspective, Southampton High Street definitely looked dull - dull and dry and lacking in green. When you can;t see much by looking down - look up. See the tree? One in an arboretum. Although it looks alone there are bound to be others in streets nearby. Indeed I found a big, flowering buddleia down a left-hand turn. Ferns by a down-pipe too. It was. I struggled to find anything. There is, I realise, little to show. Indeed, at one point I was wondering whether I should conceal the fact that I'd tried or accept I'd failed and admit it; that my theory had bitten the dust. Smooth sow-thistle (?) by a bus-stop. But no! There was a small lawn, a flowerbed and a tree. Hurray! Southampton High street is - as you see - a garden. What's more, there were wild animals. Aphids. Ladybirds! See greenfly legs sticking out from its mouth? 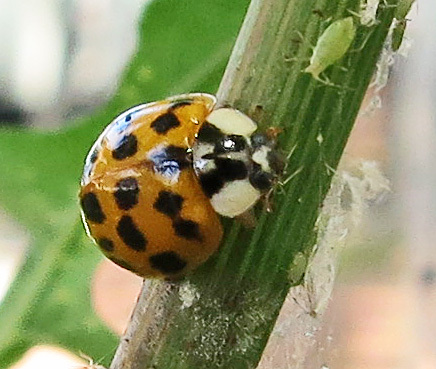 To a flock of aphids a Harlequin Ladybird is more dangerous than a lion is to a herd of gazelle. It will chomp and keep chomping. My theory holds. We're short of rain. It's rather hot. Once the pavement is watered and the gutters have been washed through with rain . . . maybe it'll become a 'Botanic' one. Perhaps it'll go in a yellow book! The current population of Southampton is around 237,000. Southampton is in Hampshire in the South of England. 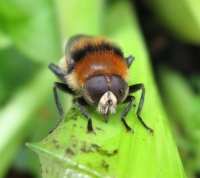 which has a picture gallery of kinds of ladybirds to look out for on its site. There's a downloadable Ladybird Identification Guide on their site too. Here's a link to find out about The Ladybirds of Ireland. Do You Post About Street Plants? Irrelevant to post but have just come across this Facebook Page of Moths found by BSG Ecology in 2014. Click on the pictures to find their names. I love this idea, how many people would know there is a tree up on top of a building or Ladybirds in the street. Will try and get one of these posts in this next week. Amanda - I hope you do post about the street plants you find. If you do - make sure I have the link so I can add it to this post. Thank you for stopping by my blog to let me know about the tree following (through my comment to Donna). I will try to participate next year. I do, so, enjoy this type of post from you Lucy, thank you. Near to our main 'super store' there is an old crumbling wall, about 20 metres tall, which is covered with Buddleja, that stuff grows anywhere! 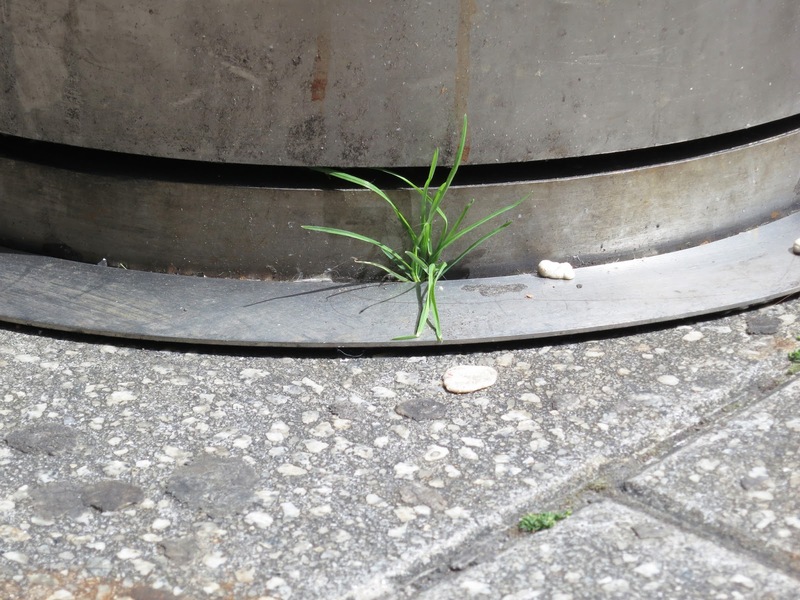 Thanks, Lucy, for including my post in your Street Plants project. 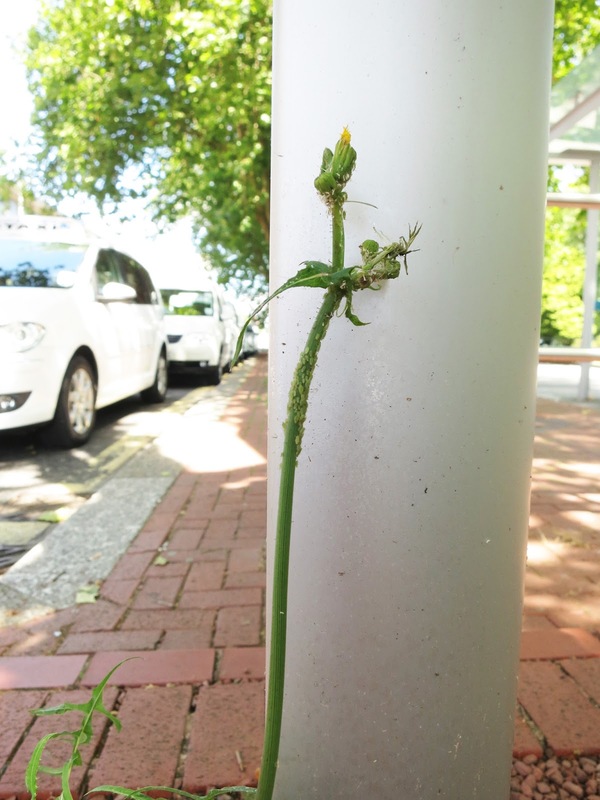 I'm definitely a person who Posts About Urban Wild Plants from time to time! It's fun. BTW I couldn't find a way to comment directly at that post, am I missing something? You have a great eye! I would never have seen that tree on the roof!